This new edition of Human Development has been thoroughly revised and updated to incorporate recent developments in the field. New material is introduced on the development of a sense of self, the social self and moral development. Beginning with a discussion of birth and childhood, the reader is lead through each of the crucial stages in human development. The authors reveal the intricate interplay between physical, emotional and psychological factors that contribute to the individual patterns of development that make each of us unique. All of the major milestones of life are covered, including adolescence, work, parenthood and old age. 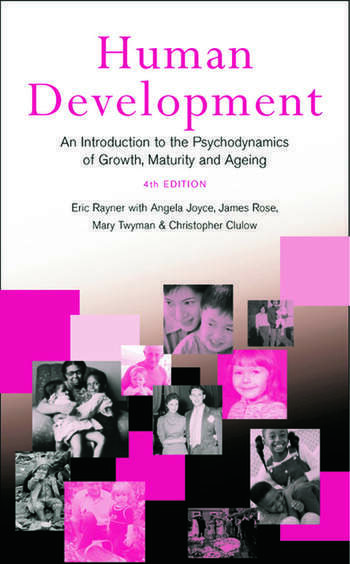 Employing psychoanalytic theories of development, this book reveals the richness that these ideas bring to well-known everyday phenomena. This highly accessible and jargon-free introduction to human development combines scientific objectivity with a sensitive and sympathetic approach to the subject. It will prove invaluable to anyone involved in the helping professions. Eric Rayner is now retired. He was formerly a psychoanalyst in private practice and a training analyst at the British Institute of Psychoanalysis. James Rose is a psychoanalyst in private practice and is a senior psychotherapist at the Brandon Centre for Counselling and Psychotherapy for Young People, Kentish Town, London. Mary Twyman is a psychoanalyst in private practice. Christopher Clulow is Director of the Tavistock Centre for Couple Relationships.